I hope you had a good month in August. Wow, this year is going by fast! There is the slightest hint of Fall in the air, here in Virginia. I always look forward to changing seasons and especially enjoy the Fall. How about you? My reading has slowed down over the summer. Below are some of the things I have been doing. I participated in a five-week online StudioPress workshop this summer and learned of two helpful websites for finding images for my blog: unsplash.com and pixabay.com. I enjoy looking through the beautiful images and seeing how I can fit some of them on my blog. I’ve been working on creating a weekly newsletter, scheduled for Saturdays. For now, the newsletter will contain excerpts and images from my posts for the week as well as links to the full posts on PostingForNow’s blog page. The format may change over time. Feel free to sign up to receive the newsletter. If you are currently receiving daily updates from my blog feed and would rather a weekly update or both, please consider visiting my blog and signing up for the weekly newsletter. (All emails include an option to unsubscribe.) Please don’t forget to open your confirmation email sent from PostingForNow and confirm your subscription. Update (9/5/2015) – The current sign up form is for free email updates of posts from Posting For Now’s blog feed. I decided not to start a new weekly newsletter. I apologize, if this change caused a problem for anyone. Update (9/11/2015) – Working on new template for subscription to email blog updates. In August, I became an affiliate of Pretty Darn Cute Design (PDCD). You may remember, I’ve used two of their themes in the past: ‘Fun’ and ‘Modern Blogger Pro. 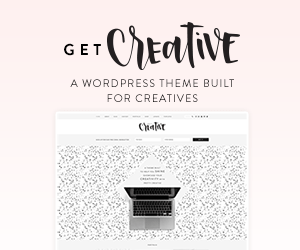 Their newest theme is called ‘Creative’. How has your summer been? What plans do you have for the Fall? Thanks to Kathryn for hosting this monthly meme. That’s great you got to participate in the Studiopress course…you must have learned so much! That image on today’s post is gorgeous! Wow! You did have a busy month! I love that you took the Studiopress course! I’ll have to check out those image websites. Thanks! Also, I want to check out Pretty Darn Cute Design. I hope you have a fantastic September!